Given the amount of dust you encounter on an everyday basis, you can only imagine how much dust and dirt comes through the window and through your shoes, into your home. At least you can shower the dirt off but how often can you wash your carpets, curtains and upholstery? A vacuum cleaner, therefore, is an essential buy to keep your home dirt-free and hygienic. There are several varieties of vacuum cleaners available in the market today — cordless, robotic, handheld, canister, etc. The one I will be reviewing is the Deik Cylinder vacuum cleaner. The Deik Cylinder vacuum cleaner is a high-power and compact vacuum cleaner that weighs 3.6 kgs. A bagless cleaner with a 4-stage filtration system, it is easy to maintain and clean, with an easy-to-remove dust container. The vacuum cleaner has an attractive look and uses cyclonic technology to get the dirt out of your carpet and upholstery, giving your home a deep clean. So far the product specifications sound promising but I’d like to dive into the features of the product to see if it’s worth its salt. The following are some of its main features. At 3.6 kgs, the vacuum cleaner is fairly lightweight, making it easy to carry. It has a 5-metre power cord and has a working radius of up to 7.5 metres, with a 1.5-metre flexible hose that helps you get to high and otherwise hard-to-reach areas. It has a 6-foot big wheel, making it easy to move from one room to another. There are several add-ons that the vacuum cleaner comes with. A 1.5-metre extension hose, an 81-cm-long chrome telescopic extension tube, a 2-in-1 crevice tool/dusting brush and upholstery tool, which ensures you can give all kinds of surfaces in your home a deep clean. The HEPA filtration system keeps allergens out of your home. The vacuum cleaner has an advanced four-level-filtration system which removes 99.97% of airborne particles that are as small as 0.3 micrometres in diameter. That means pollutants like PM2.5 and the harmful effects of smog and pollution are taken care of. These particles are meant to be removed from the air flow entirely, ensuring they do not re-enter your home. The vacuum cleaner comes equipped with a built-in high power motor of 800W. It employs a multigrade cyclonic technology which provides a powerful suction of 18 Kpa and allows you to give your home a deep clean in one swift movement. The vacuum cleaner is extremely easy to clean. It has a 1.3-litre dust container which can be detached easily. You can empty the contents of the container into a bin. The cyclone filter is also washable, making the vacuum cleaner easy to clean and maintain and the dust easily disposable. At 3.6 kgs, it is very lightweight. The bagless design makes it compact, easy to carry and easy to store. The design is also aesthetically pleasing and looks sleek. The grey and pink colours are also an attractive combination. The HEPA filtration is a definite plus. Especially since all kinds of allergens are floating around in the air, this advanced filtration technology is useful, even if you are not necessarily allergic to anything. The dust container is easy to clean, despite the vacuum cleaner being bagless. It can be detached easily and the dirt can be disposed of. Add-ons like the 2-in-1 crevice tool/dusting brush and upholstery tool seem like they would be good for all kinds of surfaces, crevices and corners. These add-ons make the cleaner more versatile. 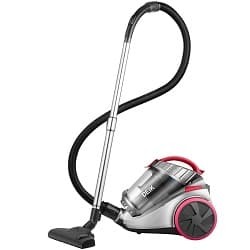 This vacuum is great if you are on a budget, coming in at well under £100. Since the vacuum cleaner is not cordless, you constantly have to look for a power socket in each different room. If the room you’re cleaning is big, the cord may simply not be long enough. A 7.5-metre-long working radius seems a bit limiting. While cleaning out the dust container and the filter is easy and you don’t even have to spend money on replacing the bags, you still will be exposed to the dirt when you empty it into the dustbin. If the vacuum cleaner was bagged, the dirt would be sealed and you would not be exposed to the allergens sucked in by the filter. Having listed the pros and cons, my final verdict is that the vacuum cleaner holds promise. Despite my reservations about a few things, the pros seem to outweigh the cons. The vacuum cleaner seems genuinely easy to use, store and also maintain. 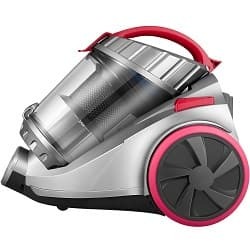 It has an attractive body and while the colour of your vacuum cleaner doesn’t matter as much, this one is an objectively sleek looking product. But looks are not all that it offers — it makes a convincing case with its lightweight, portable quality, even though it is not cordless. The add-ons like the crevice tool and dusting brush make it versatile to clean different surfaces. The flexible extension hose allows you to reach curtains high up and even corners of the ceiling. The advanced four-step filtration process takes care of not just the room looking clean but being hygienic too. It attacks not only the dirt you can see but also the invisible allergens that could make you unwell. For all these features, the vacuum cleaner also seems to be reasonably priced. So I give it a thumbs up!